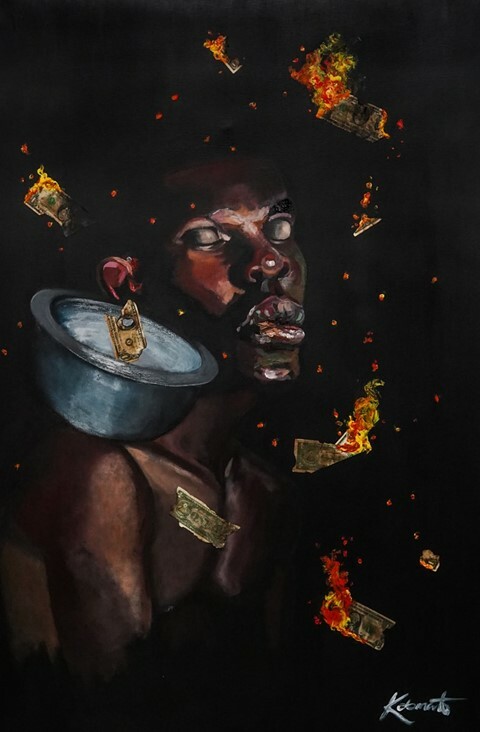 London-based painter Koby Martin’s third solo exhibition Asiamah is a visual tribute to his father, who he sadly lost a few years ago. “I lost my sense of direction without my father; I couldn’t figure my way out of the dark,” he says. Asiamah takes the viewer on a moving journey, which cinematically chronicles the aftermath of losing such a central figure. It depicts the pivotal role of his family in shaping who he is today, and combines his influences into a story of humble beginnings. Paying homage to his family name – which means “good things are about to happen to you” – the works compiled in this collection are his most touching yet. Martin was born in Ghana, where he fought to have his creative pursuits taken seriously. After struggling to make it to university in Ghana, his parents decided to send him to England, where he is based now, to study Illustration and Animation at the University of Coventry. 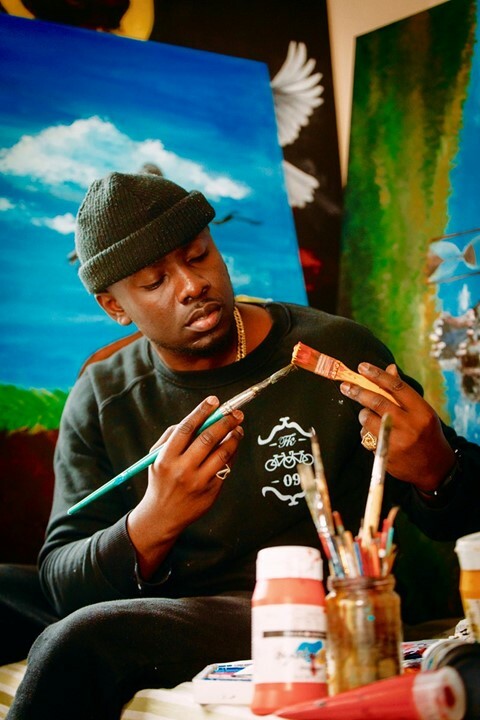 Soon after, he was picked up to design hip-hop duo Krept and Konan's debut album cover. Presenting an organic and honest version of his truth, Asiamah “sheds light on issues that are rarely spoken about or considered a taboo.” Ahead of the opening of his exhibition at The Old Street Gallery, Martin speaks about his innermost artistic notions and the importance of self-belief. Why was it important for you and your viewers to address such raw topics in the show? Koby Martin: Everyone is going through something; dealing with life, relationships, family, work, etc. you name it. I feel like artists are chosen ones with a heavenly task. The talent we possess is bigger than us. We aren’t just blessed with the gift to create fancy stuff. The gift we have is a powerful tool to cause change, stir emotions and spark conversations. Art is meant to comfort the disturbed and disturb the comfortable. What is your favourite memory with your father? Koby Martin: There are loads of them. But one that stuck with me the most was when he gave me his work shoes for school. I remember them being filled with tissues so my feet could fit in properly. Back then, I may not have understood what was going on, but looking back now it made me realise he sacrificed a lot for us, irrespective of how small it was. Also the times when my mum and dad sat on the front porch of the house during late cool nights and had conversations. My brothers and I could hear them from the inside of the house exchanging laughs. Beautiful times. 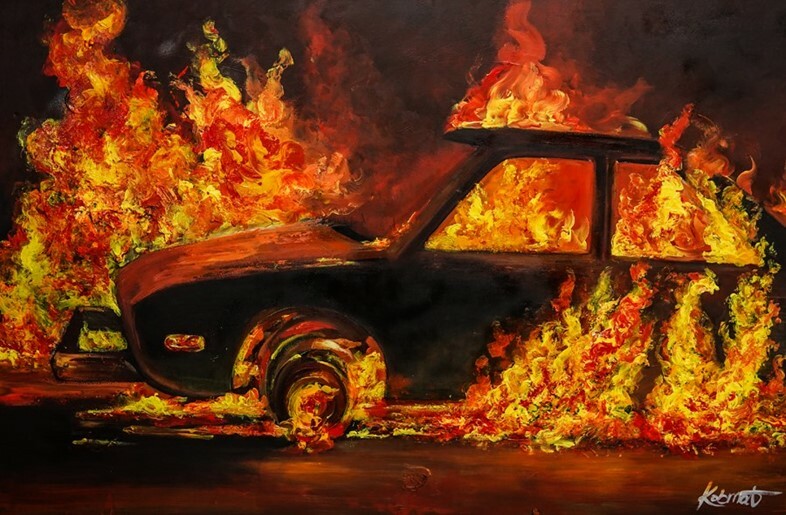 What is the significance of the painting “Set My Drive On Fire”? Koby Martin: My father was a heavy influence when it came to believing and chasing my dreams. Losing a prominent figure in your life that motivates you to be a better person daily can have detrimental effects. But just because the car is on fire, doesn’t mean you can’t walk out the journey. In other words, though he was the driving force behind my ambition, I had to make a decision to keep pushing and make him proud even in his absence. Which is your favourite painting from the show and why? Koby Martin: That’s a really tough question, to be honest. I might have to go with “The Futility of Work / Ecclesiates 2:18 – 23”. In this painting, I was basically trying to depict when I sent most of my savings back home to help facilitate the burial of my dad. It also captures the context of how we lose everything we eventually try to save; the materialistic things we hold on to, our parents, friends and loved ones. Everything and everyone will go or pass at some point in time, and we have absolutely no control over it. Your work (titles, depictions, visuals) has a strong interdependence with religion. What role did that play in Asiamah? Koby Martin: My mother’s unwavering faith in God, plus the early morning devotions have been pivotal in how I expressed myself and my faith in God through my work. Asiamah was not any different. Before I begin any project, I always pray and ask the Lord to use me as a vessel to express his thoughts of what he wants me to create. So that when people see the works, they will not see me, but experience him through the paintings and glorify him.